Tall, dark, and handsome, where have you been all my life? There are so many spectacular details to this cart, where to begin? 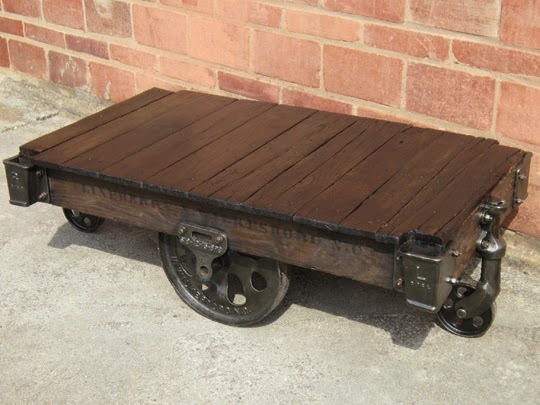 The dark walnut stain on the vintage Oak wood, together with the polish and seal on the cast iron hardware transforms this cart into an elegant, vintage industrial art piece. 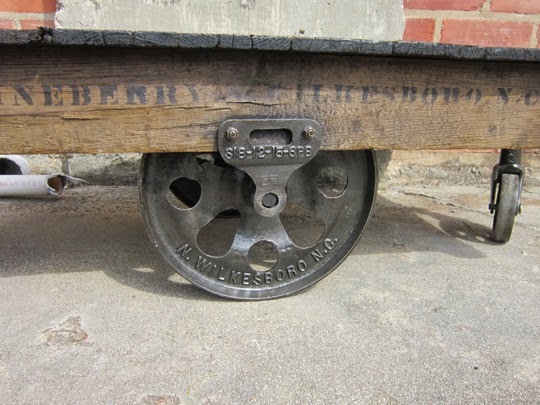 The extra large lettering cast into the large iron wheels is a rare detail: In an oversize font, it reads: 'THE FOUNDRY' - 'N. WILKESBORO N.C.' This table is truly exceptional. Hop on over to http://www.shop.oldcoldstorage.com/Dark-Walnut-Stain-Foundry-D1452-D1452.htm to see more pictures and get a freight quote.